Hi everyone, I had a chance to play with the 127mm mak tonight (it is from a Nexstar 127slt, so standard Synta mak). I was checking out some objects, namely the trapezium, at around 171x, I was able to make out the E and F stars. The seeing wasn't too stable, partly from me, every time I was breathing, it messed things up a bit. The current temperature is about 0 deg F, the scope was in my apartment, which is held about 74 deg. 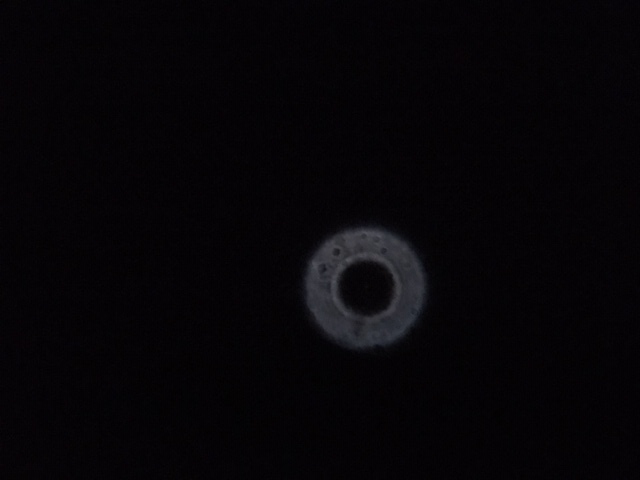 I put the scope on the porch about 1.5 hours prior, not enough time, I did notice a heat plume but it was cool enough to see the diffraction pattern. I did a quick check on Sirius at 171x (9mm Nagler Type 6), I notice a difference in the diffraction pattern on each side of focus. Please see my (albeit bad) drawing, on one side, it appears as one bright band, on the other side, it is more of a target pattern. 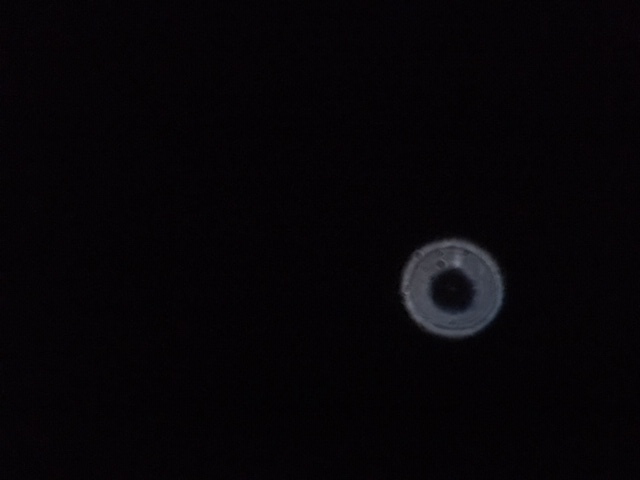 In focus, when the seeing allowed, I did see a bright dot with a faint ring around it (which got broken up when I let out too much hot air). I am curious what to make of this. Do I have spherical aberration? At low powers, the stars are pin pricks, and at higher power, they still aren't bad. Thoughts?? If the seeing was bad and the scope not temperature acclimated, I wouldn’t even begin to make judgements as to the scopes optical qualities. Wait until you have a better night. I also noticed the same difference in diffraction patterns the night before also, that was a good night (I was able to see the diffraction pattern, I left the scope to cool for like 3 hours!!). I wouldn't worry too much, is the scope new? give it some time and use it as often as you can, if the views are good on a good night then enjoy it, don't be too critical of your mirror too fast. to give an example, I have in my Dob the finest mirror, yet on some nights the star test looks as though I ground it myself blindfolded. You would be surprised how what you see one night is nothing at all like what you see on another. I also have a skywatcher 150 Mak which is a certified planet killer but, at first I was completely bummed by star test anomalies, it was me and not the mirror. Edited by Stellar1, 21 January 2019 - 11:06 PM. If you haven't already seen the threads below I recommend you have a look. In cold weather when the temperature is dropping a scope might never reach thermal equilibrium no matter how long you leave it outside, and this is especially true of Maks. Insulation rather than cooling is now considered a better way to go. Edit: I just realised you said 0ºF and not 0ºC. That's bloody cold!!! I'm not surprised the scope couldn't acclimate. Edited by MortonH, 22 January 2019 - 03:24 AM. Dismissing all of the issues about thermal equilibrium, your star test does not appear to me to be properly conducted. The test has to be done with a sufficient amount of defocus to de-sensitize it for some errors that can show up with too little defocus (higher order spherical aberration, which is present in most MCTs by design and will show in the star test if it is not defocused sufficiently, but will not be visible when the star test is done correctly). The keys to the star test are simple by vital. First, the test needs to be done at exactly the same distance inside and outside of focus. Next, the amount of defocus should be as close to 10 waves as possible. For an f/15 instrument, this amount would be about 6.7mm. So you would need an image taken with the scope 6.7mm inside of best focus, and an image 6.7mm outside of best focus. 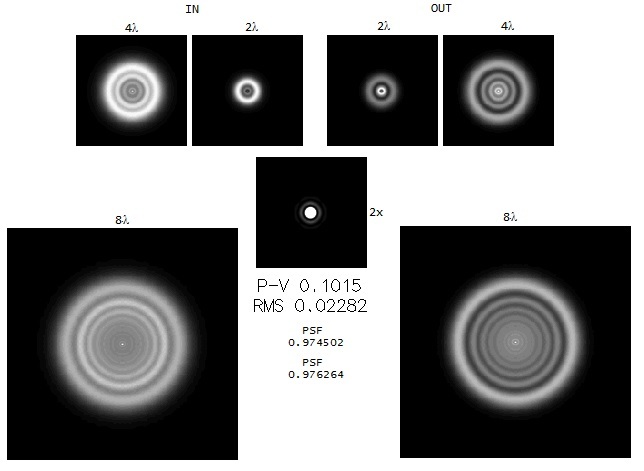 That being said, these images show spherical aberration and it is a common error in these small MCTs with most that I have seen test for showing meaningful amount of error (1/6th wave or more). The problem is that it is difficult to estimate that amount because the amount of defocus you have illustrated here is simply not sufficient. HSA Is throwing off the reading. You need to be at about 10 waves to really be able to quantify the amount of error. The above drawings simply are not sufficient to do more than say that there is probably some amount of SA and once again, I have seen dozens of tests for the small SCTs and SA is a pretty common error. Not always. A few are excellent and a few are poor, but most then do be middle of the road. Actually for this type of design, having different looking diffraction patterns on each side of focus is normal. How sharp is the image at focus, particularly, the moon? IT seems reasonably sharp, The stars look pretty tight, the trapezium yesterday looked good and when things settled down, I did notice the E and F stars. I had it up to 171x and starts looked pretty sharp also (I didn't go higher since that would be a nightmare on my mount). I will keep playing with it, I was considering on selling it to get a C5 (I figure the optics would be similar, the motivation is to shave some weight for my mounting situation). So it would appear you have a decent set of optics. How does it compare in sharpness to you SW 120ED? Not to start a controversy here but I did see you had a plume in your rendition. I live in Ohio and have very cold temps at times too. I've found wrapping the tube and dew shield of my TEC 7 and my C11 in a couple of layers of Reflectix have resulted in considerably expanded thermal envelopes in which I can use my scopes, especially after taking them outside from a warm basement. Not perfect, but much better thermal performance for my scopes and the insulation pretty much mitigates dew formation on the meniscus/corrector. Might want to give it a try. I here you about mount issues, especially at high power. I've a C5 and it's very light weight. But it's languishing right now so I might try wrapping that one up too. As Eddgie said, further from focus the errors are less sensitive. MCTs are complex designs, at a glance it appears you are seeing what you're supposed to see. Especially in focus where it matters. It may be somewhere near 1/6 waves PV on the wavefront, but that's still a good scope. The problem is, not really sure what 1/6 wave (presumably primary SA) really means. You can have up to about 0.4 waves PV of secondary SA and still be diffraction limited. It won't necessarily test like a parabola with pure primary SA and no secondary SA. The MCT employes both as a matter of design, so both will be seen. They are more difficult to star test because of it. You got E and F and say you got pin point stars. The MCT is doing it's job. You get maximum correction at best diffraction focus, anyway, i.e., in focus to the eye. Don't let the defocus star test fool you into thinking it's a bad scope because the images are not the same either side. The design wavefront looks that way on purpose. It is not a parabola, its a complex design with a complex wavefront. In focus is what matters. It's designed that way. Edited by Asbytec, 23 January 2019 - 11:13 AM. Nice set up. So you wrap the entire scope and the dewshield before you take it out? Here the startest of my Skywatcher 127 mak, a quick picture made with a iPhone pushed against the eyepiece (11 mm Nagler). Looks a bit like your startest, maybe the bright bands are little bit less bright. From what I understand these bright bands indicate spherical abberation, the brighter they are, the more spherical abberation there is. Comparing my startest with the pictures in De Suiters book about Startesting Astronomical Telescopes, I estimate the spherical abberation in my mak between 1/4 - 1/6 lambda, so not too bad. Edited by Edwin, 23 January 2019 - 01:37 PM. Edited by AlienRatDog, 23 January 2019 - 03:57 PM. I think so, too. That changes the sensitivity to errors. It looks like you saw more secondary SA, which is fine. You can have a little less than half wave PV secondary SA and be diffraction limited. The images above are what Eddgie meant by doing it correctly further from focus. Edited by Asbytec, 23 January 2019 - 06:41 PM. What you are really supposed to use is the ratio in difference between the secondary shadow inside and outside. As for not testing the same on both sides because it is complex, that is simply not true. The rays either converge and diverge exactly the same or they don't and if they don't, it means there is some aberration present. The skill of star testing is knowing how to know how to identify the different errors and to quantify them. My advice? Don't star test if you don't take the time to learn how to do it properly and analyze the result. "As for not testing the same on both sides because it is complex, that is simply not true." It is true. Look at the high/low balanced waveform. 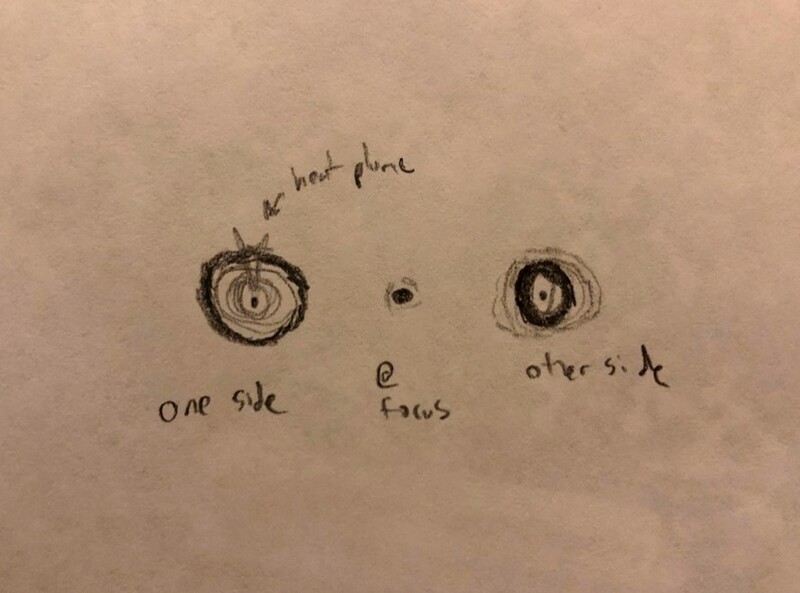 We are not going to see pure under or over correction (apparent in the sketch), rather a mixture of HSA and LSA (opposite sign) where the HSA cannot be fully corrected by the Primary without an asphere (probably an ellipse). What we see close to focus, where the star test is most sensitive, is the residual higher order (secondary) spherical from the edge and from the center. These are the two halves of the residual higher order error Roland speaks to in his essay on star testing complex designs. The way they converge toward focus along the caustic causes the defocused patterns to differ in a particular way (approximating the sketch above). A difference either side is also true of pure LSA and pure HSA, but the sign of the pure SA wave is unchanged with respect to paraxial focus. In the MCT, I understand the sign varies with respect to best focus. Again, this is because of the residual HSA that cannot be fully corrected. One only need look at the balanced low/high SA waveform to see this is true. And you can see this in a star test. You're right, though, it's difficult to figure out what's going on. Its not as simple as pure LSA, for example, with respect to a spherical wavefront because the wavefront only approximates a sphere in a more complex way. It's more like zone(s) rather than pure SA. It looks like severe under correction in his sketch that may not appear diffraction limited, but that is not what is happening. The complex wavefront is bending back toward a reference spherical wavefront instead of continuing to deviate from itas normal over correction. This undulating wavefront more closely approximates a spherical wave improving RMS. We cannot test a MCT in the classical way we might test a parabola with pure correction error because that is not what is happening despite the appearance of heavy correction error. We have to understand the MCT tests with a mix of HSA from the meniscus and LSA of opposite sign from the primary leaving in some residual HSA from the edge and from the center. That's what the sketch shows close to focus, it shows the result of the design balanced low/high SA waveform at nearly equal distances from best focus. Edited by Asbytec, 24 January 2019 - 06:44 AM. Let me start here: a 5" MCT showing the E and F stars in the Trapezium at 171x, while obviously not at thermal equilibrium, does well indeed. That said, your scope shows some signs of spherical aberration. But with the results in focus, I would not worry about it. Especially with an OTA costing only a few hundreds of dollars. Perfect optics drive the price of a similar size MCT up to the thousands of dollars, if available at all. Not a direct quote, but Suiter addresses the issue in his book on star testing. Paraphrased, he says that light waves either propogate perfectly or they do not and if they do not, then there is something modifying them. The problem with MCTs is that they have higher order sphrical aberration, and if too little defocus is used, this can make the pattern appear much different (because that is something modifying the pattern) but if the defocus is very small, then it is so sensitive that it is showing an error that would have little effect on the in-focus image. And here is a thought argument. I am going to link a page that shows a bunch of MCT tests, showing both double pass gratings and defocused images. What I would invite the reader to do is look though these and note the correlation between the inside an outside of focus images to the star test. See how the Ronchi tests that have the straightest lines also seem to have the best secondary shadow balance? Now if Suite were wrong, we would expect to see a discrepancy between these to tests, but there are at least 60 MCTs tested here, and the ones with the best Ronchi tests also show the best pattern of star test. How would someone explain that? It would seem logical to me that if Suiter were correct, then these tests should agree, and this page will show that when the shadow breakouts are balanced, the Ronci tests also show a good instrument. Again, this is physics. Either the wavefront converges perfectly or it does not. Physics demands that if it does not converge perfectly, then it will not diverge perfectly, so any deviation from the image inside and outside of focus is telling us that there is something modifying the wavefront. It is the burden of the tester to decide whether it is a serious error, or something like some small amount of HSA that has little impact. Here is the page. There are some excellent MCTs and SCTs shown here, and there are some horrible ones (One Meade SCT that is probably over half a wave of SA). And I see this "Complex telescopes don't test right" all the time. The propagating wavefront is one of the most sensitive tests one can do. It misses nothing. You can see errors as little as 1/40th of a wave. If you see that the shadows are unbalanced it is telling you that something is modifying the wavefront and it is not perfect. that is hard and fast physics. The rest is interpretation. Take scope #15 from the page above. 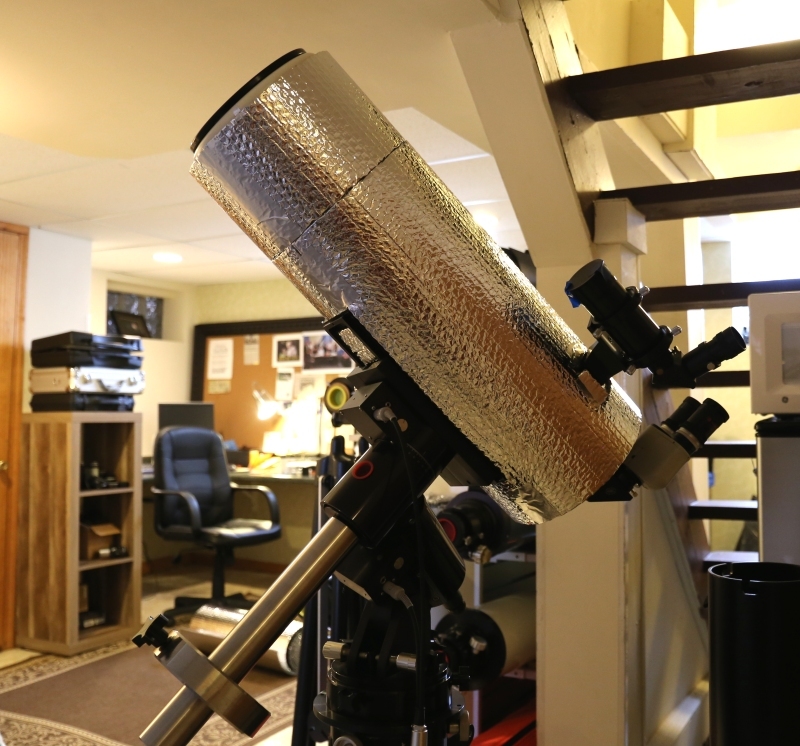 This is a Skywatcher 102 MCT. The Ronchi lines are quite straight and the secondary shadow is very well balanced. These agree that this is a really nice little 102mm MCT. Look at scope #41. The Ronch lines show a slight turned edge, but the lines though the center of the pattern are very straight and the secondary shadow is almost perfect. Now, look at scope #137! Another 102mm Skywatcher, but here, the lines are badly bowed, and the secondary shadow is shown to be much larger on one side of focus than the other. So, what makes more sense? Which or these three scopes does the reader thing would have the best optics? If they believe that complex instruments don't follow the laws of physics, then them might think scope #137 would be OK, but if they do believe in the laws of physics, my bet is that given a choice, they would choose scope #15 or scope #41! I know I would because they have much better star tests and the Ronci tests show better optics as well. Ah, and I reference the above by number but people may not know how to find them by numbers, so here is how I do it. Not all of the images will do this, but if you scroll down the page about 20 telescopes, look for any image that shows the "Hand" or "Grab" Icon and click the image. Any image that shows the hand will do. When you click that image, the image will pop up and at the bottom of the page, you will see a numbered index of all of the images on the web page. This will allow you to quickly go back and forth between the three images I mention above. And for grins, the Meade I mentioned is #144. If you were to tell the owner of that scope that he should ignore the star test because the star test is not reliable for complex images, you would be tricking him into keeping a horrible telescope with over a half a wave of spherical aberration. Once again, the Ronci and the star test are both screaming LEMON!!!! By comparison, scope #149 is a very high quality optic. Balanced secondary shadow and very straight lines. So, why is it that the scopes with the best looking Ronchi tests all have the best looking star tests?? Edited by Eddgie, 24 January 2019 - 03:26 PM. Here's OSLO simulation for a perfectly made 127/1500 MCT. Top Strehl is polychromatic, bottom mono. Too much defocus. If you defocus 25 waves, even a bad SA will start to look less severe. Best to use 10 waves. This confuses things because you are running a simulation for a design that shows a Strehl of .97. My guess would be that this deviation from true perfection (Streh of 1) is because of the higher order spherical aberration of the design. If this is a correct interpretation on my part, this would mean that even if the scope were perfectly fabricated, it would only put 97% of the energy into the Airy Disk. And if that is a correct assumption on my part, then that means that the reason the star test is not exactly the same on each side of focus is because the wavefront is being modified by the higher order spherical aberration. Also, this test is shown for 2 and 4 waves, and once again, this is not consistent with the way Suiter recommends doing the test. If 10 waves of defocus were used and the obstruction were included in the simulation, the star test for this scope would look just about perfect (assuming it were perfectly made). Suiter himself says that this test is overly sensitive to HSA and that in the presence of HSA, it is important to very carefully quantify the error because most of the time, HSA will have little bearing on the in-focus image. And if you would further indulge me, which of the three 102mm MCTs I referenced in the above web page (#15, #41, and #137??) do you think would have the best optics and why would you choose it? The point here is that the star test is super sensitive and will disclose even the very slightest error, even when that error is too small to have any meaningful effect on the in focus image. .976 Is not perfect. It is very close to perfect, but it is not perfect. If it were truly perfect, the wavefront would converge perfectly and diverge perfectly. No such instrument exists. The best manufacture tolerance I have seen is .991 made by Roger Ceragioli. I am told that he spent dozens of hours figuring this instrument. Ah, but while the manufacture tolerance was .991, the design was a non-ED triplet refractor, so polychromatic Strehl was probably in the .85 range so even though the optics were perfeclty made, the star test would show the wavefront modification caused by chromatic aberration.